This year in commemoration of Earth Day, each class was given a pot of money plant 3 weeks before the event. Students had to look after their plants and reflect on their learning journey while doing it. By taking care of the plants, they learnt to appreciate nature better and the importance of taking care of the environment. During the event itself, students watched some videos and viewed some Power Point slides on the different types of pollution that are doing harm to our Mother Earth. They also learned about the various ways in which they can save their environment. In addition, some of the students became supermodels on that day. 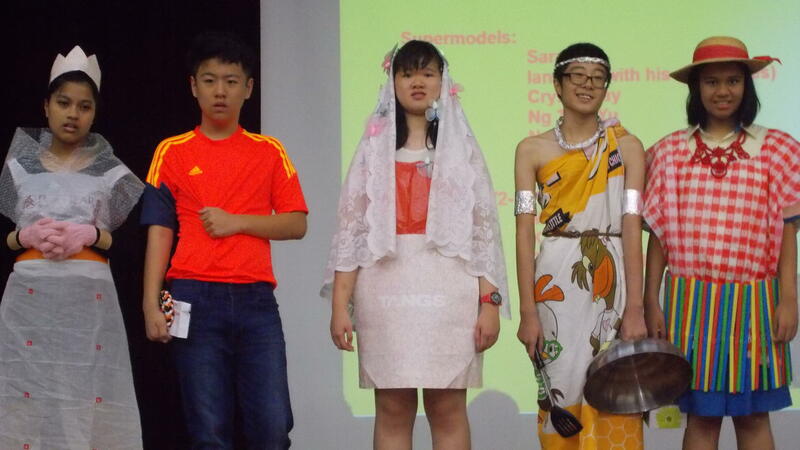 They donned interesting fashion pieces which they had created using recycled materials. The staff from Crowne Plaza Hotel came to our school to celebrate Earth Day with our ASD and C level students in the morning session. Together they planted bean sprouts using red beans, cotton wool and recycled water bottles. The students had an informative and eventful Earth Day this year.